Since graduating in 2006 from Furman University with a degree in Music and Communication Studies, Sarah has taught many students, young and old taking pride in establishing herself as a noteworthy instructor and local musician. Music is a passion and in sharing it all with her students, teaching everything from Bach to the Beatles, fuels her to cater to each student and their individual needs. 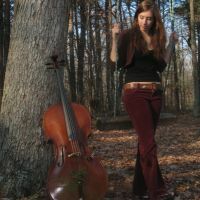 Sarah has spent her years playing cello in Colorado, Georgia, Tennessee, North Carolina, South Carolina and all over the southeast. She has even taken her talents abroad to Austria and Germany. In 2005 Sarah spend time at Hummingbird Productions in Nashville, Tennessee, writing and performing music for commercial use and doing other session work. Since moving to Greenville in 2002, Sarah has played countless hours sessioning and performing with local talents. Additionally she has played with the Furman Symphony Orchestra and the Foothills Philharmonic Orchestra. Sarah is also hired for a myriad of events. These gigs include playing parties, cocktail hours after weddings, church services and celebrations, as well as in coffee shops to large venues playing with her duo O Mello Cello Tree. Along side performing and instructing, Sarah prides herself in her collaborative projects such as music festival production. Every summer you will find Sarah at Paris Mountain State Park, hosting Music in the Woods! A free, completely solar powered festival that runs every Saturday. Check out www.cellotreearts.com for more info! Even Sarahs' cello students have a chance to perform each summer at the festival for a Music in the Woods recital. Other projects you may find her working on include managing her duo O Mello Cello Tree and participating in the planning committee for large Greenville events such as Fall for Greenville. To take lessons, hire Sarah for a gig or to get into the collaborative spirit, do not hesitate to contact her. All questions and inquires are welcome!